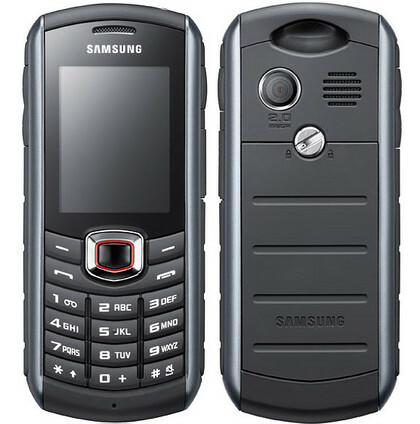 It may not be the most stylish of phones but it is designed to be sturdy, reliable and able to withstand dust, knocks and splashes. It has large keys that are simple to use, although the navigation pad proved rather more fiddly in use. What do you want from a phone? A stylish, feature-packed smartphone or a tough, sturdy phone that will not collapse at the first sign of rough treatment? This latest in a line of ruggedised handsets from Samsung is certainly no catwalk model, but it is tough and solid. And like other tough phones, it doesn't boast a load of high-end features. We have only seen one tough phone that boasts a lot of clever features and that's the top-class Motorola Defy, which offers Android cleverness along with good strength. While the Solid Immerse is certainly tougher, it can't match the Defy's smartphone credentials. Despite this, though, it is more sophisticated than some of its other tough rivals. Samsung's range of Solid handset has been aimed at those who are rather clumsy or who do tough outdoors jobs - builders for instance. This handset has been aimed at the outdoorsy type - who want a device that won't fall apart if it's dropped while you're hiking or rock climbing, for instance. And with its GPS on board, it's clear it's these people that Samsung is targeting with the Solid Immerse. It might not be a full sat-nav replacement, but at least you'll know if you're heading in the right direction. In the menu you'll find an Apps icon, which takes you to all kinds of options for those in the great outdoors - think compass, stopwatch, pedometer - and an FM radio for some musical entertainment. The keypad buttons are large and domed, so they're easy to use even if you're wearing gloves. They may not be stylish but they are eminently practical. The navigation pad doesn't measure up quite so well - it sits lower in the frame than we'd have hoped, so you may find you hit the wrong button when you're navigating sideways. It's a pity, because you need to use the pad to access the shortcuts carousel that sits at the top of the screen to head into the messaging, music playback, camera and so on. It's still usable, but doesn't make for such a speedy experience as we might have hoped. The screen is low-resolution, and sits quite far from the front of the phone - but it has to sit away from the les to stay safe. The lens is also scratchproof, which means that it's not as clear as on other phones - but if it's important to you that your screen isn't scratched when it sits in a pocket with a bunch of keys, this is a pretty big consideration. As the phone's name suggests, waterproofing is a big selling point of the Solid Immerse. It will still work if it's under a meter of water and can survive in the drink for up to 30 minutes. To change the battery, you'll need to use a penny to turn the clasp, which makes it feel very secure. It survived the water torture well in our tests - we turned on the loudspeaker and could even hear our caller's voice when the device was sitting at the bottom of a sink of water. On the top of the device is a large hook for attaching to a lanyard, so you shouldn't be in too much danger of dropping it anyway. Onboard are also Twitter and Facebook apps - just log on to receive your updates. It's not the integrated app you'll find on many devices, but it's a speedy way to keep in contact with friends. The snapper is pretty basic - no flash and two megapixels - but it's good enough for the odd snap. You'll find no 3.5mm headphone jack - you'll have to use the microUSB connector, which is covered. Plus, there is no Wi-Fi, but would you get a connection anyway if you were hiking in the wilds? The Samsung Solid immerse is hardly the kind of phone you'd be showing off on a night out, but it might prove handy for finding your way home, thanks to its GPS and handy torch facility.